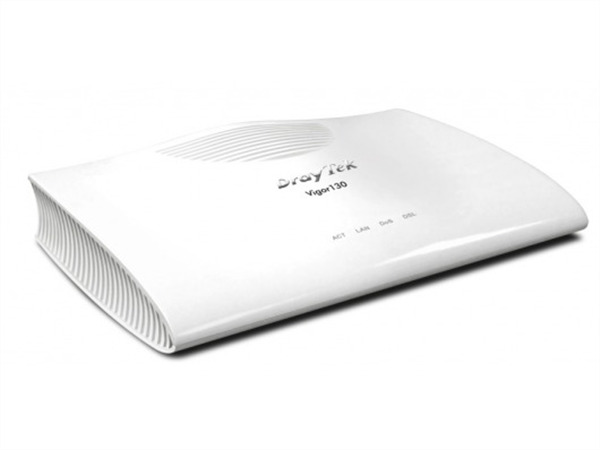 The Vigor130 is an IPv6 ready compact VDSL2 router with ADSL2/2+ fallback for residential and business broadband access requirements. It supports PPPoE/PPPoA relay (PPPoA to PPPoE bridging) so a firewall, router or a PC can log into the Internet directly, having complete control over the DSL connection. It’s Multi-PVC function makes triple-play deployment with ease. The Vigor130 can satisfy different services such as Data/Video/VoIP/Management provided by ISPs via the single VDSL2/ADSL WAN port. And its Gigabit Ethernet LAN port allows devices in the LAN network to get faster data transmission for essential applications. Besides powerful it’s firewall protection against malicious Denial of Service (DoS) attacks, the Vigor 130 is designed with more advanced security feature such as Stateful Packet Inspection (SPI) to offer network reliability by detecting attacks and prohibits malicious penetrating packets from entering internal network. For preventing access to inappropriate websites, the Vigor130 also offers URL filtering to set customized rules.